In Hawaii Aloha is love. In Pittsburgh (Pennsylvania) Yinz is our "y'all". In Italy Mangia is eat. This is a blog about a serious love for food regardless of location. To help you remember how to spell dessert (yummy after dinner sweets) versus desert (a warm sandy location) here's a trick - dessert has more s's because you always want more! Bryce and I met in August of 2008. Three months earlier he'd completed his time in the United States Marine Corps: 4 years of weekly haircuts, camouflage, yes sirs, 1 tour of Iraq (speaking of the desert), some time as an MP, pecker checker, you name it, he did it! OOH RAH. 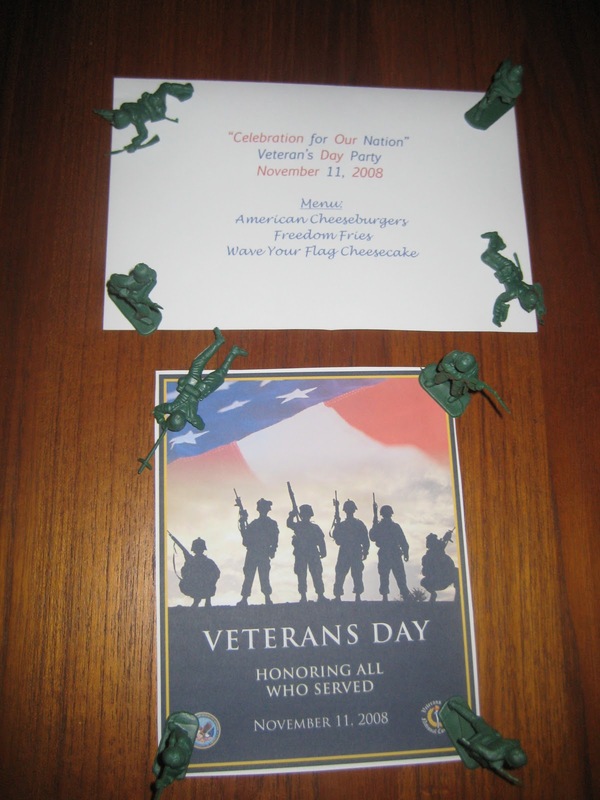 For our first Veteran's Day I threw him a little shin dig: we had machine guns, sand storms, terrorists... kidding! We had name tags, printed menus (AMERICAN cheeseburgers, FREEDOM fries, and Wave Your FLAG Cheesecake), toy Marines, Veteran's Day print outs, and activities - Bryce had to come up with a list of Military slang terms for us civilians to decode! Blanket party anyone?! We were brand new and it was super cute, awwwwwe :) You'll notice his lack-of-weekly-haircuts in the photos, he went through an "I'm a civilian now and I'm NOT cutting my hair" phase for quite some time. 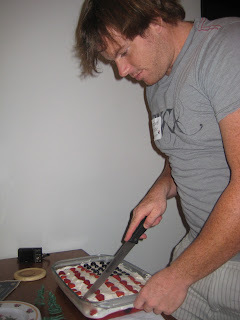 I made the flag cake again in 2009 so this year it was getting old and un-fun. Plus, that recipe is time consuming! This year I decided to try out those scrumptious mini cheesecakes my Mom has been making my whole life, since the others I've tried this year hadn't turned out so well (remember the Mini Orange and Chocolate Cheesecake ordeal?) 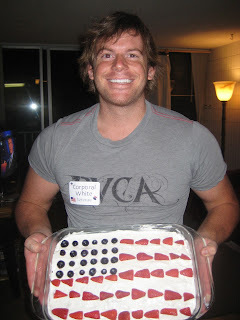 I topped them with red strawberries, white Cool Whip, and blue-berries and they were ever so adorable as much as they were patriotic. Place foil liners in each muffin tin & one vanilla wafer in each liner. In the mixer combine cream cheese, vanilla, and sugar. Then add eggs, mix well, and pour over wafers, filling each compartment 3/4 full (which I can never seem to do evenly). Chill, then top with desired fruit, nuts, chocolate, etc. My Mom usually does cherry pie filling, MMM! 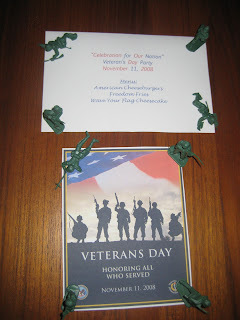 In all seriousness, Veteran's Day means so much more than silly parties and red, white, and blue desserts. I am so proud of and thankful for Bryce, and of all our Veterans, for sacrificing their lives for our country's freedom. 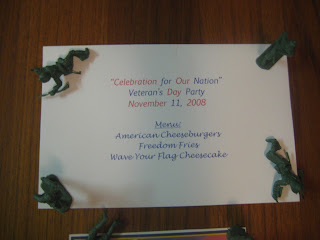 The land of the free because of the brave. Thank you! And just for fun, here's civilian Bryce in 2009 with the cutest little boot camper I've ever seen in my life, aka USMC Bryce in 2004. That looks scrumptous....Oh yeah the cupcakes too;) See Bryce was always a cutie pie!!! Love the presentation of the Mini Cheesecakes!! Geaat job...Mama's proud!!! Thanks Mama - they're so easy! That's supposed to say boot camp! Recent reviews by Angela A.